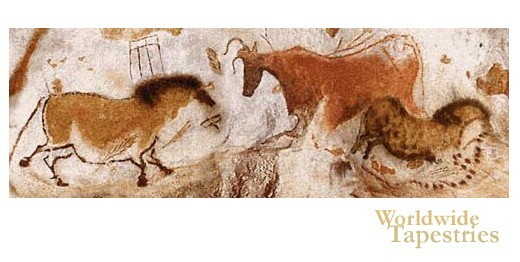 This tapestry "Lascaux Part" shows part of a scene from the famous caves painted over 30 000 years ago. The cave Lascaux in France were discovered by teenagers on a wandering expedition, which led to the realisation from historians that these are among some of the most ancient artworks discovered. In this scene we see cows and horses in their beautiful reds and browns, so beautifully preserved in the originals in the cold and protected cave air. This tapestry "Lascaux Part" is backed with a lining and has a tunnel for easy hanging. Dimensions: W 60" x H 20"